Ana Albert is the Operations Manager of Mark Anchor Albert and Associates. Ms. Albert is a no-nonsense, take-charge businesswoman focusing on cost-effective results, with over 25 years' experience managing and supervising successful company and law firm operations. She also is a communications and management specialist who has applied her administrative skills to a diverse range of professional environments, hiring, organizing and motivating teams for over two decades. Before employing her administrative, management and operational skills in the legal field, Ms. Albert served as the President of Timeless Essence, Inc., a real estate sales and development company, and as President of Beauty Zone Corporation, a manufacturer and distributor of high-end beauty products. 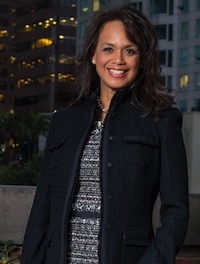 She previously worked as Senior Vice President of Operations, Sales and Marketing for Lancie International, a direct sales cosmetics company, Acclaim Studios and Entertainment, a feature film and post production company, and EGP Corporation, a three-store retail chain specializing in video games. A charismatic native of Hawaii, Ms. Albert has worked with many Fortune 100 companies, including Pepsi Cola, Subway, TCBY, and Dominos Pizza, in cross promotions and other coordinated marketing strategies that included media planning, media buying relating to print, radio and television, special promotions, special events, networking, newsletters, credit and pricing strategies, celebrity endorsements, and placements on the Home Shopping Channel. As Operations Manager of Mark Anchor Albert and Associates, Ms. Albert implements business principles and financial management and administrative practices to streamline case operations and increase efficiency and cost-effectiveness for the Firm's partners and their clients. To that end, Ms. Albert assists in the supervision and management of IT professionals and data management personnel to implement automation and information technology solutions to ensure the delivery of high quality legal services in document-intensive cases involving large volumes of data. She also implements and supervises case management and accounting procedures to increase productivity of attorneys and staff and reduce Firm and client expenses, increasing plaintiff case profitability and reducing defense costs. These supervisory and administrative procedures enable the accounting, human resources, document management, and client services components of the Firm’s practice to operate more efficiently. This helps to ensure that cases are managed in a businesslike fashion that reduces redundancies, waste and inefficiencies. The goal is to achieve the best possible results at the lowest practicable expense for the Firm's clients, while devoting personal, one-on-one attention to each client's needs. Ms. Albert also is actively involved in charitable activities in the greater Los Angeles area on behalf of individuals who are ill and impoverished, or are otherwise disadvantaged and struggling. She assists the Firm in its provision of pro bono legal work for indigent individuals. Ms. Albert believes that the Firm’s commitment to pro bono, charitable and civic contributions in the communities where it actively practices law engenders good will which enhances the Firm’s effectiveness in advancing its clients’ interests, both in and outside the courtroom.